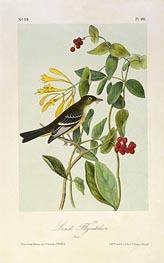 Audubon was born in Haiti (then called Saint Domingue), the illegitimate son of a French sea captain and his mistress, and raised in Nantes, France by his stepmother. In 1803 his father obtained a false passport for him to travel to the United States to avoid the Napoleonic Wars. 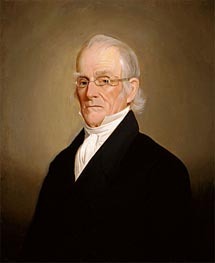 He caught yellow fever and the sea captain placed him in a boarding house run by Quaker women who nursed him to recovery and taught him the unique Quaker form of English. 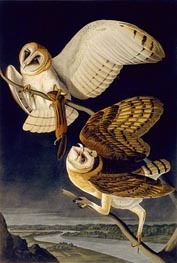 In that year he met and became engaged to his neighbor Lucy Bakewell, whom he married in 1808. 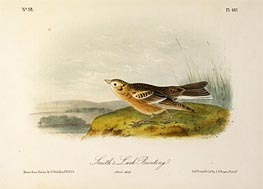 He oversaw a family farm near Philadelphia and began the study of natural history by conducting the first bird-banding on the continent; he tied yarn to the legs of Eastern Phoebes and determined that they returned to the same nesting spots year after year. 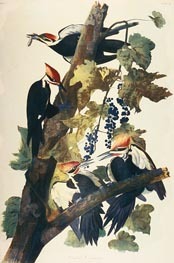 He also began drawing and painting birds. After years of business success in Pennsylvania and Kentucky, he went bankrupt. 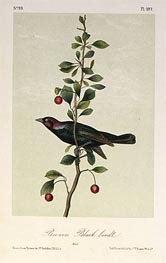 This compelled him to pursue his nature study and painting more vigorously and he sailed off down the Mississippi with his gun and paintbox and assistant, intent on finding and painting all the birds of North America. 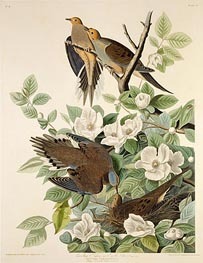 In order to draw or paint the birds, he had to shoot them first, using fine shot to prevent them from being shot to pieces. He then used fixed wires to prop them up, restoring a natural position. 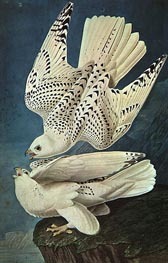 His birds are set true-to-life in their natural habitat. 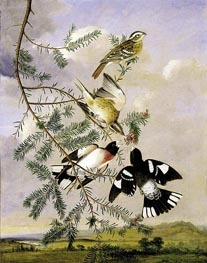 This was in stark contrast with the stiff representations of birds by his contemporaries, such as Alexander Wilson. 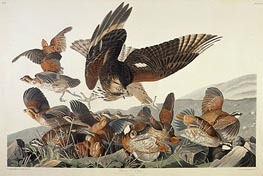 Audubon once wrote: "I call birds few when I shoot less than one hundred per day". 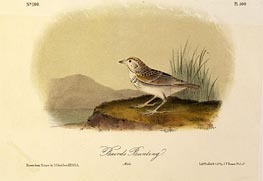 One of his biographers, Duff Hart-Davis, reveals: "The rarer the bird, the more eagerly he pursued it, never apparently worrying that by killing it he might hasten the extinction of its kind." Since he had no other income, he eked out a living selling portraits on demand, while his wife, Lucy, worked as a tutor to rich plantation families. 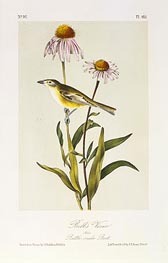 He sought a publisher for his birds in Philadelphia but was rebuffed, in part because he had earned the enmity of some of the city's leading scientists at the Academy of Natural Sciences. 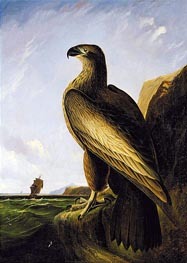 Finally, in 1826 he set sail with his portfolio to London. The British couldn't get enough of images of backwoods America and he was an instant success. 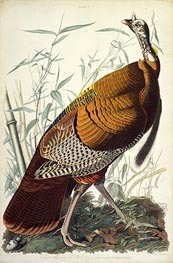 He was lionized as "The American Woodsman" and raised enough money to publish his Birds of America. 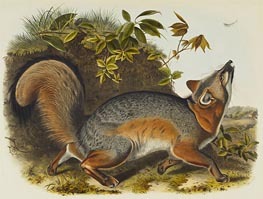 This consisted of hand-colored, life-size prints made from engraved plates. 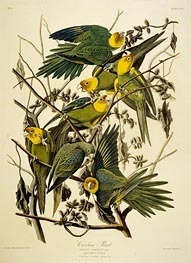 Even King George IV was an avid fan of Audubon. He was elected a fellow of London's Royal Society. 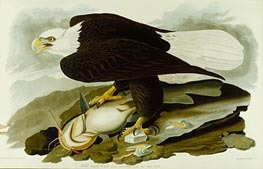 In this, he followed the footsteps of Benjamin Franklin, who was the first American fellow. 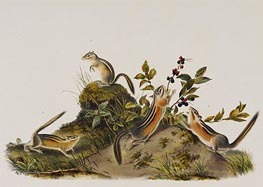 While in Edinburgh to seek subscriptions for his book, he gave a demonstration of his method of using wires to prop up birds at professor Robert Jameson's Wernerian Natural History Association with the student Charles Darwin in the audience and also visited the dissecting theatre of the anatomist Robert Knox (not long before Knox became associated with Burke and Hare). 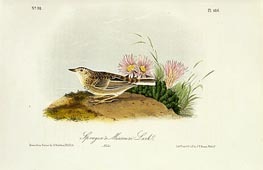 He followed his "Birds of America" up with a companion work, Ornithological Biographies, life histories of each species written with Scottish ornithologist William MacGillivray. 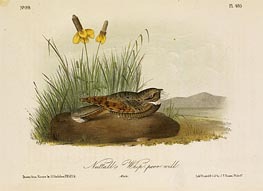 Both the books of paintings and the biographies were published between 1827 and 1839. 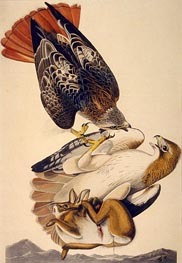 During that time, Audubon continued making expeditions in North America and bought an estate on the Hudson river, now Audubon Park. 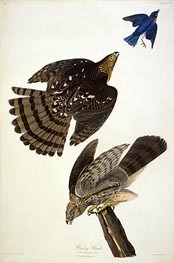 In 1842 he published a popular edition of Birds of America in the United States. 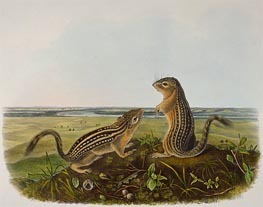 His final work was on mammals, the Viviparous Quadrupeds of North America. It was completed by his sons and son-in-law. He is buried in the Trinity Churchyard Cemetery at 155th Street and Broadway in Manhattan, New York. 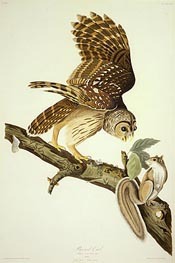 The National Audubon Society was incorporated and named in his honor in 1905. Several towns and one county (in Iowa) also bear his name.